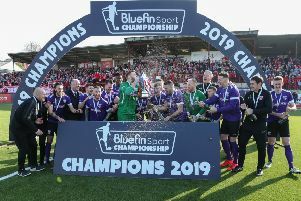 Crusaders manager Stephen Baxter knows that his side will not get an easy passage through to the final of the County Antrim Shield. Baxter’s men face Championship side Larne tonight at Seaview with a place against Ballymena United or Linfield in the final up for grabs. The Crues saw off Institute 3-2 on Saturday in the Danske Bank Premiership to win the three points. But they needed a 98th minute penalty from Rory Patterson to win the encounter. The Crues also had a shaky start to their league campaign but they have now won their last five games - but Larne are also flying high in the Bluefin Sports Championship as they have won 14 and drawn two of their 16 league games to date. Crusaders boss Baxter knows it will be a tough test for his side but he has two big league games against Glentoran and Linfield on the horizon. “They are flying but it is two different leagues and of course you are aware how well they are doing and I was on an Irish League show before we all kicked off with Tommy Stewart. “And I said on that show that they would not lose a game of football all season. “I haven’t changed my mind and they have quality beyond quality. “If they were playing in our league right now they would be in the top four. “So that tells you the players they have and the level they have. “And they are bringing boys in from professional football in England it tells you where they are aiming for. “And they will look at this game playing against us as gauge as to where they are at this moment in time. “We are looking forward to the challenge but I will have to weigh-up the three or four ice bags that we had in the changing room after the Institute game. “We will have to look at the injured players we have and where we are to risking players with the league games coming up.